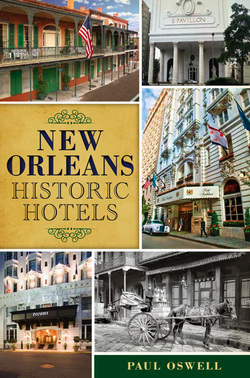 The hotels of New Orleans have welcomed countless visitors in a history stretching back to the 18th century. From humble boarding house beginnings to the grand hotels of the 19th century and through to the modern properties that stand today, hotel life in New Orleans has reflected the city’s own story. From political scandal to celebrity intrigue to events that shaped the landscape of the entire country, the story of New Orleans’ hotels is an endlessly engaging one. Travel writer Paul Oswell checks into the great hotels of the past and the present, telling the story of the properties that stood the test of time, as well as those that didn’t. Using city records, newspaper archives, vintage travel guides and anecdotal stories in the best New Orleans tradition, he brings each one to life, and in the process, fleshes out the story of the city’s hospitality industry and, by extension, its very history.